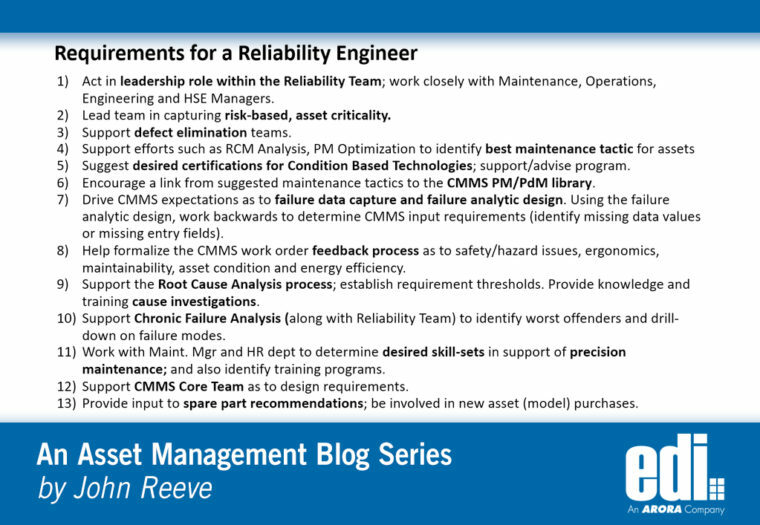 13 Actions for a Reliability Engineer - Arora Engineers, Inc.
Every organization is different. Just as there might be one person in a planner/scheduler role, there might also be only one Maintenance/Reliability Engineer. But, if we were to talk about the ideal org chart, it might be as described as follows (from Paul Barringer). The task of a Reliability Engineer is to prevent failures. This is a strategic task. The task of a Maintenance Engineer is to quickly restore the failure to an operable condition. This is a tactical task (often driven by adrenaline for timely restoration). Both jobs contain elements of the other role and each engineer must know about each other’s tools to adequately perform the task. An analogy exists between tasks in most fire departments around the world when you consider the preventive tasks of the fire marshal and the tactical tasks of the firefighter. Reliability engineers are to the fire marshal as maintenance engineers are to the firefighters. This list still involves the Reliability Engineer with the data – especially failure mode. When analyzing a particular complex problem as to the cause of the failure, it might start with the Technician, then Maintenance Supervisor, Maintenance Manager, Maintenance Engineer, and then Reliability Engineer. And maybe this process is only adhered to on assets with mid to high business risk exposure. Act in leadership role within the Reliability Team; work closely with Maintenance, Operations, Engineering and HSE Managers. Lead team in capturing risk-based, asset criticality. Suggest desired staffing, skills and certifications for Condition Based Technologies; support/advise program. Encourage a failure mode link from suggested maintenance tactics to the CMMS PM/CBT library. Drive CMMS expectations as to failure data capture and failure analytic design.Using the failure analytic design, work backwards to determine CMMS input requirements (identify missing data values or missing entry fields). Help formalize the CMMS work order feedback process as to safety/hazard issues, ergonomics, maintainability, asset condition and energy efficiency. Support the Root Cause Analysis process; establish requirement thresholds. Provide knowledge and training cause investigations. Support Chronic Failure Analysis (along with Reliability Team) to identify worst offenders and drill-down on failure modes. Work with Maintenance Mgr and HR dept to determine desired skill-sets in support of precision maintenance; and also identify training programs. Support CMMS Core Team as to design requirements. Provide input to spare part recommendations; be involved in new asset (model) purchases.